Before there was "The-Baitman.com". Before there was Facebook. Before there was social media in general, fisherman had very little accessible information on the internet. The two major players for bass fishing junkies were the Bass Fishing Homepage, which was a glorified version of Microsoft Word turned into a message board or Bassresource.com, which was the first "VBulletin" style forum to my knowledge. It was on the Bass Fishing homepage, I met "Triton" Mike Bucca, whom is now known as one of the "OGs" of the swimbait world. But he wasn't an overnight success, in fact it would be his ability to hustle and provide efficient customer service that has set him apart from other bait-makers. He found his niche and exploited it to his target audience. It also helps when you make a bait that catches #Jaints,. It probably hasn't hurt either than some of the top touring pros in the country have been spotted with the Bull Shad on the front deck of their boat. (Hint KVD). Mike has been one of my best friends in the fishing industry. I witnessed the growth of his company from the beginning to where he is now. Not only do I respect him as a bait-maker but also a business man who has never stopped his hustle or lost his desire to take care of anglers. This is the story of how a Full Time guide from Lake Altoona Georgia who has built one of the most popular swimbait companies in the United States, if not the world. Bucca, a self admitted swimbait fisherman, began his quest for the perfect "Gizzard" immitator after days and days of guiding on his home waters of Lake Altoona, Georgia. A scenic lake full of spotted bass and largemouth bass just outside of Atlanta. Bucca's "Trout" of the South grew slowly, but what power the internet did have back in the middle to late 2000s, was good enough for the Bull Shad to grow an underground following. Youtube wasn't monetized and pond hopping, senko-slinging teenagers weren't making videos raking in tens of thousands of dollars in google ad money just weren't happening. But, Bucca had successfully filmed some videos of his bait in action, crushing stripers, largemouth, and spotted bass. The fishing world took notice, more importantly the swimbait anglers did. Now that Bucca had a bait that could match one of the most common forages across the United States, the Shad. He had a bait that could be marketed from West-Coast to East-Coast, up North or in the Dirty South. You can find some sort of shad in almost every lake, making the marketability of the Bull Shad expenetial compared to other popular swimbaits that only seemed to cater to one small portion of the United States. But getting the rest of the fishing world to notice wouldn't be an easy task.Because Bucca's Bull Shad were so much different to an average angler, especially tournament bass fisherman. It initially had a few setbacks, that still have left anglers on the fence. Size, and Price were the main culprits but there was a strange amount o anglers who didn't think it was "pretty enough." Retailers were still skeptical how they could sell a $60.00 swimming fish. But that never stopped Bucca. Hustling Bull Shad swimbaits on his own website, message boards, and selling in person at fishing tackle trade shows grew the Bull Shad's popularity quickly. When photos from happy customers started rolling in Bucca was reinforced the appeal of his bait. It gets bit. With the rise of popularity also became more questions. Anglers are always looking for more info to get "bigger bites", how to tune his baits, etc. Mike has never strayed away from communicating with his customers. Something he learned before he was building baits for a living. "Catching fish and being accessible to the public are the 2 main things that help me. Making a design that is fool proof and teaching those people how to use your baits to catch more fish is invaluable. As for service I have a long background in the restaurant business. I ran restaurants for 15 years so customer service comes very natural to me. My customers love that I am accessible if they have any questions or problems with their bait. They know I will stand behind my products and that is what brings them back. " It didnt take long for the fishing industry to roar its ugly head. Unfortunately now, more than ever, this has become the norm. Which is a topic for another article in its own entirety. Nonetheless as Bucca's Bull Shad swimbaits began to gain even more traction among anglers across the country, copy-cats baits started to appear. Mass produced baits that were designed to cater to anglers on a budget. Price-point cookie cutter baits that have nothing but a factory in China behind them. More than anyone Bucca felt the effects of bigger companies trying to play ball in his field. Mike stayed true to his nature to be original and the respect from him is mutual throughout the bait making world.
" Anyone can copy a baits core design and change the cosmetics a little and call it their own those are what I call "copy cat" artists. They love your design so much they take the shape, joints and change the tail and cosmetics up a little and boom. When they are called out they say it swims different or you can only make a shad bait look so many different ways but when you have guys like Mickey at 316 making his version of a shad bait, You got Matt lures with his version of a shad bait and both are very legit made baits and their are others. So that kinda puts holes in the theory that there are only so many ways to make a shad bait because of shape or joint styles and such.. But when you steal the core design the original bait maker did all the hard work the design, the shape, the swim, and most important the marketing behind the bait your just piggy backing on top of his work and not your own." 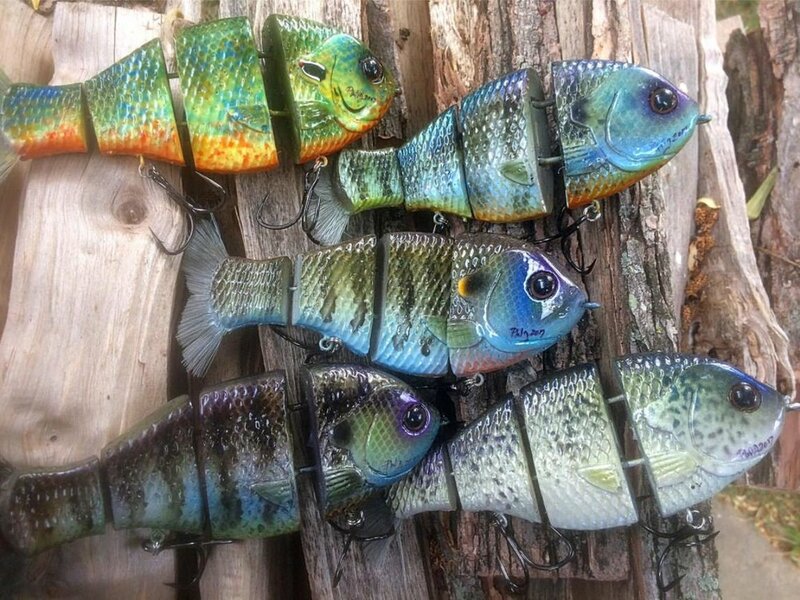 As far as being innovating, Bucca has expanded his line of baits from the original Bull Shad to the "Bull Herring, Bull Gill, Bull Rat, and even offering up custom painted baits direct to the consumer, while still maintaining his own identity. But even though Mike recognizes great baits when he sees them and how easily it could be to make something just like the other guy, he is still loyal to his roots and originality. "It's those guys that push the envelope and try to be innovative in their creations that excel in this industry and are here long term. I read somewhere that if you have to copy someone else's designs that you admit defeat and that is so true. It's a unwritten cat and mouse game among my peers. I'll admit that there is one bait maker that has a very unique rigging system that I absolutely love. I slap refuse to copy his method not only out of respect for that bait maker but because I have to push myself to be more innovative than the next guy. Don't think innovation is easy because it's not but that doesn't mean you have to wave the white flag it just means you need to think about it harder"
But as for new projects.....Mike is very hush-hush. Even to his best of friends. A select group of guys, and I mean select usually get to put their hands on a bait a month or two before it comes to market. Even then, Mike isn't exactly gun-ho to just hand prototype baits out. For the most part it stays in his back pocket till the last minute. So what can e expect from "Triton" Mike in 2019? Mikes Baits can be found on his website www.bullshad.com . His Facebook Page can be found Here as well as his Instagram page.